AS IS - PARTS or REPAIR. 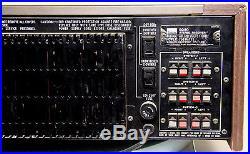 This listing includes ONE (1) Sansui Model 9090 Stereo Receiver. The receiver powers on, there is not sound coming out of the unit. Cosmetically it is in clean overall condition with scuffs & scratches throughout. Missing most of the knobs - please see photos. Please review all attached photos near the bottom of the page. And be sure to ask any questions. The Sansui 9090 is a high output version of the 8080 stereo receiver with 110 watts continuous, per channel (minimum RMS) at 1000Hz both channels driven into 8 ohms, with no more than 0.2 % distortion. 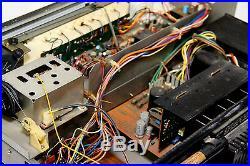 It has a highly selective FM front-end, through very sophisticated electronic design. Features include four meters: power (each channel); signal strength; tuning, power protection circuitry and LED indicator, triple tone control with turnover selectors, two tape deck terminal facilities, Dolby FM/4-channel adaptor facility, wide dynamic range from precise phono equalisation system, full range of controls, connections for three sets of speaker systems and FM Multipath detection system. Power output: 110 watts per channel into 8 (stereo). Frequency response: 10Hz to 30kHz. Total harmonic distortion: 0.2%. Input sensitivity: 2.5mV (MM), 100mV (DIN), 100mV (line). Signal to noise ratio: 70dB (MM), 80dB (line). Channel separation: 50dB (MM), 50dB (line). Output: 100mV (line), 30mV (DIN), 0.75V (Pre out). Dimensions: 540 x 182 x 397mm. Salesbaron is in Los Angeles, 90039. WE ACCEPT ALL MAJOR CREDIT CARDS. If for any reason you are not satisfied with your order, please let us know right away. Please give us a chance to solve any issues that you may have for any reason before leaving feedback. 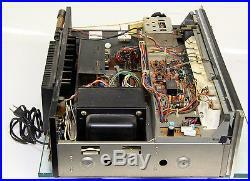 The item "Sansui Model 9090 Stereo Receiver 750 Watts Parts or Repair" is in sale since Thursday, January 28, 2016. This item is in the category "Consumer Electronics\Vintage Electronics\Vintage Audio & Video\Vintage Stereo Receivers". The seller is "salesbaron1" and is located in Los Angeles, California. This item can be shipped worldwide.